Around Mom's Kitchen Table: Mom's Texas Pecan Pie Recipe: My Mistake That Caused A Pecan Pie Fiasco! Mom's Texas Pecan Pie Recipe: My Mistake That Caused A Pecan Pie Fiasco! Thanksgiving Day, 2008, I had Thanksgiving dinner at my house. My children and their families were there, as well as my husband's two uncles. Everyone else was out of town for the holiday. While I cooked, my daughter gave her dad a lesson in oil painting, which was an annoyance, since they were hogging the dining table while I was trying to get everything ready. I made a traditional meal, turkey, dressing, all the trimmings, and pecan pie. I used my Mom's Texas Pecan Pie recipe. It is so rich and delicious that she never failed to gain high praise for it. Mom has made this pie for so many years, I don't even know how old the recipe is. I can definitely remember it from the middle 1960's. Unfortunately, I did not know how to read her instructions very well. The instructions said to bake until a knife inserted in the center comes out clean. What it should have said was until the knife inserted comes out with a clear coating instead of dark coating. Needless to say, I way overbaked the pie. It wasn't even chewy. It had the consistency of hard candy, and was very difficult to cut into slides, even more so to chew. While the flavor was wonderful, and everyone loved the taste, I couldn't wait to get my mother on the phone to find out what I did wrong. When she explained what 'until a knife inserted in the center comes out clean' meant, I knew what I did wrong. The next pies I baked using this recipe were perfect. Mom's recipe is below. The flavor of this pecan pie is divine. I hope you enjoy it! In case you don't know, shelling pecans stains your hands brown and tears your cuticles. Buying your pecans saves your hands, and makes baking a pecan pie much faster! on November 22, 2015. Thank you! Delicious--Even when cooked too long! Combine the first 5 ingredients, and then beat with an electric mixer until blended. Bake at 350 degrees for 50-55 minutes, or until knife inserted in the center comes out clean (see note in introduction!). 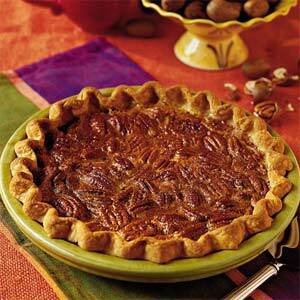 Do you have a favorite pecan pie recipe? Looks so delicious and of course Thanksgiving-worthy at it's best! Love!! Hi Kim, thanks for commenting! It is a delicious Thanksgiving dessert. Your pie looks beautiful! Would love to try your recipe. Pinning. I always thought that same about what "a clean" knife meant in baking. Thank you for sharing your recipe with us at Snickerdoodle Sunday. Hope you have a wonderful week! Hi Laurie, thank you for commenting. I enjoy linking up at Snickerdoodle Sunday, and appreciate you for hosting it. I've had a few of those old recipe mishaps, too! The pie looks so pretty and I'm sure delicious! Pinned and Tweeted. I'll be featuring your pecan pie as my Snickerdoodle Special at the next party. Thanks for sharing with us! Thank you, Beverly! I appreciate the comment and am super excited to be featured at the Snickerdoodle Sunday party.